Getting ready for some holiday blooms? Try planting an amaryllis bulb. It&#x27;s fast, it&#x27;s easy, and the colors are dynamite! Here are some basic tips on getting those bulbs in containers and eventually into the ground. 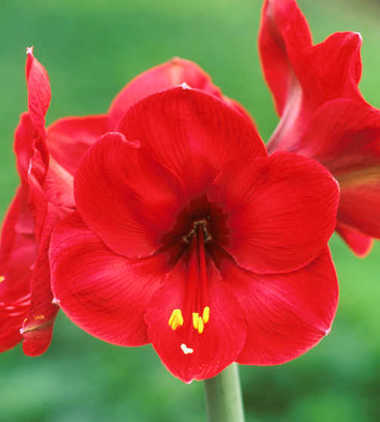 initial planting an amaryllis blooms best when somewhat pot-bound, so choose a pot that is about seven inches (17.8 cm) deep but no more than an inch or two (2.5 or 5 cm) wider than the diameter of the bulb. A clay pot is preferable to a plastic one, because its weight will provide stability when the plant becomes top-heavy. Be sure the pot has one or more drainage holes; the roots of an amaryllis will die if the soil around them is constantly soggy. Cover the holes with pieces of broken clay pots or fine-mesh screen to keep the soil from washing out. Fill the pot about halfway with potting soil, packing it in fairly firmly. Then set the bulb in place and pack more potting soil around it, leaving an inch of space between the soil line and the pot’s rim. The top third of the bulb should protrude above the soil line so that water won’t accumulate around its neck and cause it to rot. When the bulb is packed in, water it well once. Don’t water again until the bulb shows active growth. Place the pot in a bright, warm room (65 to 75 degrees F (18 to 24 degrees C) by day, 5 to 10 degrees cooler at night) while the roots are developing. Within a few weeks, the first signs of the bud stalk will appear. Leaves usually begin to appear later. Water the plant whenever the top of the soil feels dry, and feed it twice per month with bulb food or a liquid fertilizer (5-10-5 is best). Rotate the pot daily to encourage even growth of the broad, strappy leaves. You may wish to support the heavy bloom stalk with a wire stake. When buds begin to open, move the plant into a cooler, shadier room. Heat and bright light will cause the flowers to fade and wither more quickly.